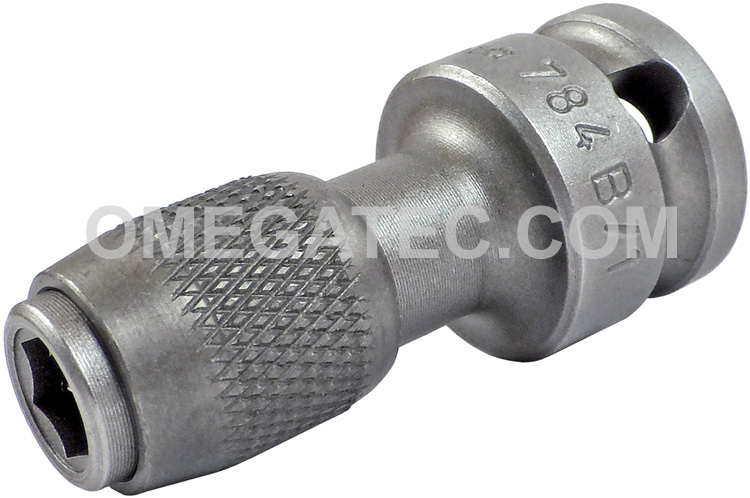 Application: Suitable for 1/4" DIN 3126-C 6,3 and 5/16" DIN 3126-C 8 (ISO 1173) hexagon insert bits and Wera Series 1 and 2. Design: With Wera quick-release chuck. The 05042765001 Wera 784 B 3/8'' Quick-Release Adaptor is one of thousands of quality tooling products available from MRO Tools. Please browse Wera Adaptors for tools similar to the 05042765001 Wera 784 B 3/8'' Quick-Release Adaptor. 05042765001 Wera 784 B 3/8'' Quick-Release Adaptor description summary: Wera 784 B 3/8'' Quick-Release Adaptor. Male Hexagon: 5/16'' Female Square: 3/8'' Overall Length: 50mm / 2'' Quantity discounts may be available for the 05042765001 Wera 784 B 3/8'' Quick-Release Adaptor. Please contact MRO Tools for details.